KUNG FU YOGA TOPS THE CHINESE NEW YEAR BOX OFFICE CHART IN SINGAPORE! Action-comedy KUNG FU YOGA, starring international superstar Jackie Chan and directed by Stanley Tong, collected a stunning SGD $1.85 million at the box office over the Chinese New Year opening weekend from 26th January to 30th January on 46 prints island-wide, topping the local box office chart! It is undeniable that Jackie Chan continues to win the hearts of the audience with his unique blend of action and humor. And because only he can surpass himself; not only did KUNG FU YOGA top the local box office for the Chinese New Year opening week, the spectacular result also breaks Jackie Chan’s personal record as the biggest opening weekend, SGD $1.37 million from 26th to 29th January, for his Chinese movies in Singapore! What better way to kick start the New Year than with action, adventure and good laugh Jackie Chan style? Clover Films, mm2 Entertainment and Golden Village Pictures are excited to announce that Jackie Chan, Director Stanley Tong, together with their co-actors, Disha Patani, Amyra Dastur and Mu Qimiya, will be in Singapore on 20th January for the KUNG FU YOGA Singapore Promotional Tour! During the promotional tour in Singapore, the cast and director of KUNG FU YOGA will have a Meet-and-Greet Event at Plaza Singapura. Remember to catch the stars at the Meet & Greet event! Jackie Chan x Director Stanley Tong is back with KUNG FU YOGA! Asian superstar Jackie Chan and Director Stanley Tong are back together again! The formidable duo, who produced classic action box office hits including FIRST STRIKE, RUMBLE IN THE BRONX and SUPERCOP, brings us the upcoming Chinese New Year blockbuster KUNG FU YOGA! Jackie Chan, Director Stanley Tong, together with their co-actors Aarif Rahman, Disha Patani, Amyra Dastur and Mu Qimiya, will be in Singapore on 20th January for the KUNG FU YOGA Singapore Promotional Tour! This will be Jackie Chan’s first movie promotional tour in Singapore since DRAGON BLADE in early 2015. KUNG FU YOGA, a China-India co-production, tells the story of Jack (Jackie Chan), a renowned archaeologist based in China’s ancient city of Xi’an who teams up with Professor Ashmita (Disha Patani) and assistant Kyra (Amrya Dastur) to locate India’s lost treasures of the Magadha kingdom. Together with the help of Jack’s assistants ? Xiaoguang (Lay Zhang), Nuomin (Miya Muqi) and Jones (Aarif Rahman), son of an old friend, the group embarks on an exciting adventure that brings them from the high plateaus of Tibet, to metropolitan Dubai, and finally, to mesmerising India. 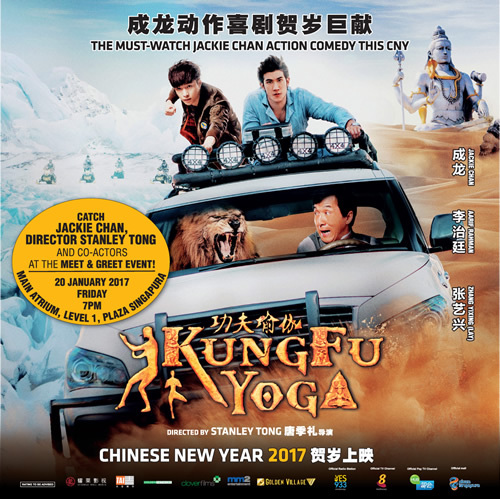 KUNG FU YOGA is co-distributed by Clover Films Distribution Pte Ltd, mm2 Entertainment Pte Ltd (a wholly owned subsidiary of mm2 Asia Ltd.) and Golden Village Pictures Pte Ltd in Singapore. The movie opens island-wide Chinese New Year 2017!